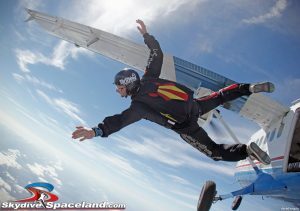 Is it about time for your first hop and pop (low-altitude emergency exit simulation) in our Skydiver Training Program? If you’re like most skydiving students, chances are you are more nervous about this jump than most of your full-altitude skydives! The lower exit altitude combined with the 5-second maximum deployment time, and possibly your first time opening the aircraft door, seems like a very tall order when you try it for the first time. This exit is no different from any other solo diving exit you’ve done, except that you’ll need to be stable and deploying within 5 seconds to pass this level of the program. Here are 8 tips on how to rock that hop and pop! Check the winds aloft and discuss the spot with your instructor before boarding. It’s hard to check the spot on jump run if you don’t know where it is. Be prepared to open the door. Chances are good that your instructor/designated jumpmaster will have you sit by the door and open it especially if it’s your first time (BEER!). At 1500 feet, you’ll remove your seatbelt, check your handles, check that seatbelts are off of the jumpers near you, then get a thumbs up regarding seatbelts from an instructor or experienced jumper near the front of the plane. Only then will you open the door, which is easiest when done from a kneeling position at the center of the door. After reading all of these tips, watch this video on how to open/close the aircraft door. Keep an eye on the ground while you’re climbing and find the airport early. This will give you practice at recognizing where you are relative to the airport, and give you an idea of how long it will be before you’ll get door and exit lights from the pilot. Your view of the area is best from right in front of the door, so take this opportunity to pick out the usual landmarks and use them to find the dropzone. Ask your instructor/jumpmaster for help if you can’t find it. Get a good gear check before exit. ‘Nuff said. Check your handles before exit. ‘Nuff said. When the door light goes on, put your goggles on if you haven’t already and look outside the plane to check the spot. Don’t just find the airport; figure out if you are in about the right spot relative to it for the day’s winds aloft. Also lean your head out of the plane to look around and check for other airplanes below you. Checking for traffic is important because while most pilots in our airspace are in contact with Air Traffic Control and they are being routed away from our drop zone, occasionally a pilot will miss the warnings or have a radio problem that keeps them from knowing about us. Aircraft below us can be a major safety hazard, especially if they are below, behind, and traveling in the same direction. Those are the aircraft that are right where you are going when you jump out. If you see an aircraft below you, check with your instructor to see if it really is an issue. You may need to call for a go-around to let that aircraft get out of the way. Now that you’ve checked the spot, the traffic, and your gear/handles, you’re ready to dive out on green. This exit is no different from any other solo diving exit you’ve done, except that you’ll need to be stable and deploying within 5 seconds to pass this level of the program. On the green light, stand facing out the door with your left foot forward and exit when ready. Leave the airplane by pushing off straight out the door (not upward), left foot last, and with your right side (hip, shoulder, and elbow) higher than your left. This will put the wind on your chest and belly for stable belly flight out the door. Chances are you’ll turn a little with your head down the hill as you exit, and that’s just fine. Deploy your parachute calmly after 5 seconds or less, and you will pass your hop and pop level. If you become unstable/tumbling on exit, sort it out as quickly as you can and remember to pull by 3500 feet whether you are stable or not. The parachute will open into the relative wind, so it may not be directly above you since you aren’t at terminal velocity yet, and the wind is coming horizontally from the prop when you first leave the plane. After rocking your hop and pop, you know you’re ready to jump safely in the unlikely event of a low aircraft emergency. As always, ask your instructor any questions before your jump. Blue skies! Previous PostPrevious I Feel The Need for Speed! Next PostNext Red Light, Green Light, No Light?